A list of 7 ways to experience England in Kissimmee. I’m always surprised by how many international accents I hear around Kissimmee. We’re a world-class destination here in Central Florida. And those charming English accents are the ones I love most. The Brits come for vacation and fall in love with our perfect weather—and give us a lot of culture in return, too. And if you love that so British appeal like I do, it’s so fun to know you can get a taste of another country and culture right here in Kissimmee—with no passport required, of course. Read on for my favorite spots for experiencing a taste of England. Alice in Wonderland, that is. And by tea time, I mean a dizzying spin in the tea cups at the Mad Tea Party ride at Disney’s Magic Kingdom® Park. No one can resist the twists and turns, and it’s impossible not to smile as you encourage your teacup to spiral faster and faster. Yes, this totally retro ride will whisk you right back to your childhood. But that’s what I love about it. 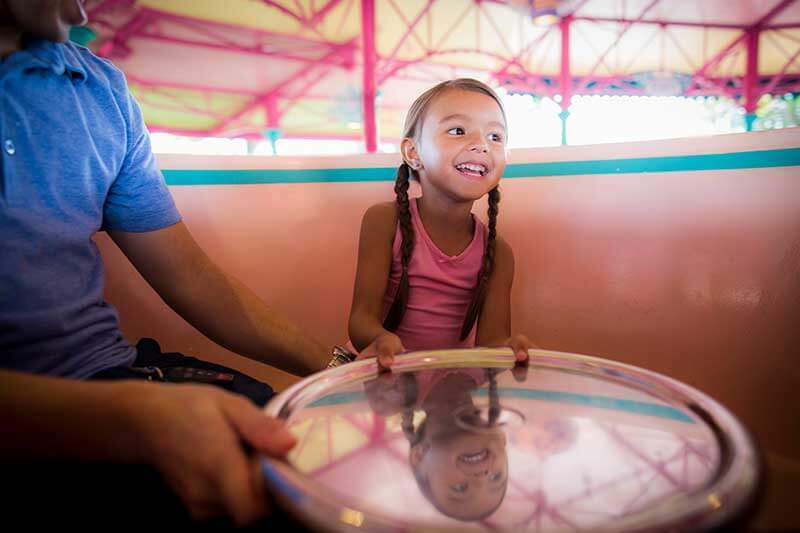 Take a spin in a teacup on the Mad Tea Party ride! I always bump into a British expat or two looking for creature comforts during shopping trips to Kissimmee’s fun Old Town—part amusement park, part outdoor shopping mall. They’re usually browsing the goods at the British Isle Connection shop, eyeing the Marmite or meat pies with longing. Those are just a few of the tasty treats you can pick up here for an authentic taste of the old world. Shop for Scottish and Irish brews and sodas and gourmet English chocolates. Browse the soccer (er, make that football) jerseys from your favorite English teams and pick up Doctor Who collectibles. Equal parts whimsical and practical, the shop surprises with Blighty souvenirs. 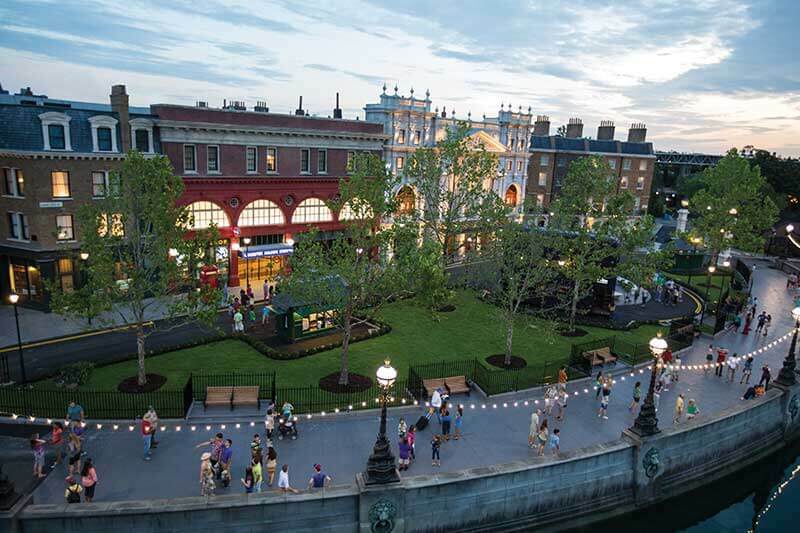 The attraction before you enter The Wizarding World of Harry Potter™ – Diagon Alley™ at Universal Studios Florida™ is the London waterfront at Universal Orlando Resort™. I love posing for photos here at classic London landmarks (ideal for tricking your friends on social media into thinking you’re abroad!). Pause to watch buskers perform in front of the station, too. Then you and your fellow adventurers can head for the entrance to Diagon Alley™. After enjoying some Butterbeer™ at the Leaky Cauldron™, continue your journey into Diagon Alley™ which has everything from wands and cauldrons to Bertie Bott’s Every-Flavour Beans™. If you have a park-to-park admission ticket, you can board the Hogwarts™ Express in King’s Cross Station in Universal Studios™ for The Wizarding World of Harry Potter™ – Hogsmeade™ in Universal’s Islands of Adventure™. Across the pond in Central Florida. Experience the London Waterfront at Universal Studios Florida™ Theme Park. I love to catch Manchester United on the flat screens (or whatever other top European sporting event is going down) while feasting on authentic English pub grub at this atmospheric bar and restaurant. The dark wood interior at The Fox & Hounds Public House pairs with bartenders from across the pond for a bonafide British feel. Their fish and chips are my favorite in Florida, and you won’t go hungry either with a big plate of bangers and mash. A proper English garden complete with topiaries and Tudor and Georgian facades makes for lots of English ambiance at the United Kingdom Pavilion in Epcot’s World Showcase. Whenever my friends and I do the drink-around-the-world thing at Epcot, the pavilion’s Rose & Crown Pub is guaranteed to be one of our stops. The piano player gets everyone going with sing-alongs and there’s a killer selection of British beers, scotches, and ciders on tap. 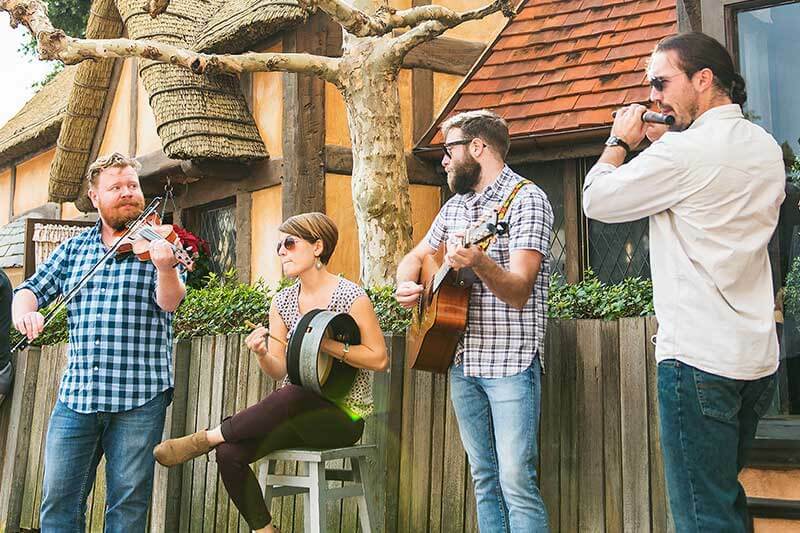 After the fun at The Fox & Hounds Public House, enjoy a musical performance by Quickstep at Epcot’s United Kingdom Pavilion. Playing sounds and songs from Europe on fiddle, flute, and Irish frame drum, this UK quartet is out of this country – literally! Quickstep at Epcot is a joy to hear! 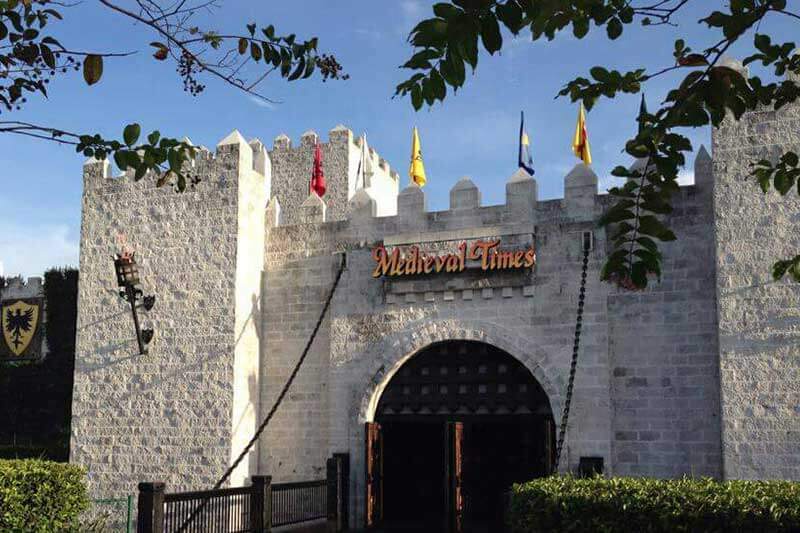 Even if dinner theater isn’t your thing, it’s fun to swing by the Medieval Times castle to snap another perfect Instagram shot in front of the drawbridge of this classic castle, complete with towers and colorful flags fluttering from the battlements. Inside, knights zoom toward their opponents on mighty steeds, jousting in hopes of becoming the King’s Champion. Monarchs may not rule America, but at Medieval Times, royalty reigns. Immerse yourself further in the past at the Medieval Village, a re-created 12th-century village that displays authentic antiques from hundreds of years ago. Cheers to the knight and to the Queen at Medieval Times. Kissimmee is full of experiences that remind you of jolly old England without leaving the country, which is brilliant. If you fancy a go, explore and have a smashing time. Cheers!